A user is able to log into the PackageTracker website on a PC, and is able to install PackageTracker onto a mobile device, but when attempting to log into PackageTracker on the device, the user receives an error message saying "Username and password combination not found." Although the user has been created in the PC web browser's Manage Users section, the user has not been assigned a License (short for Mobile License). The user had a License at one time, but it was revoked. A new user has been created on the PC, and the user has been assigned a License, but the mobile device does not have the updated database with the change. Go directly to Step 5 below. 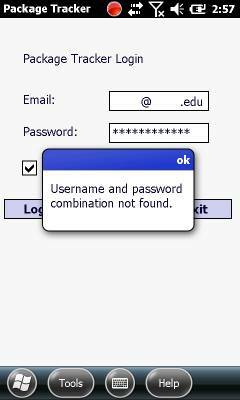 A user has changed their password on the PC, but the mobile device does not have the updated database with the change. Go directly to Step 5 below. Log into the PackageTracker website on a PC as a user with Admin rights. At the left, click Manage Users. In the list, click the user who needs to log into a mobile device. In the License column for the user, click the Add button. Note: If all the Licenses have already been used, you will need to Revoke another user's License, or purchase additional Licenses. To make the change take effect on the mobile device, at PackageTracker's login screen, tap Tools button, Download Data. The user should now be able to log in on the device. This article was written using PackageTracker v1.2.